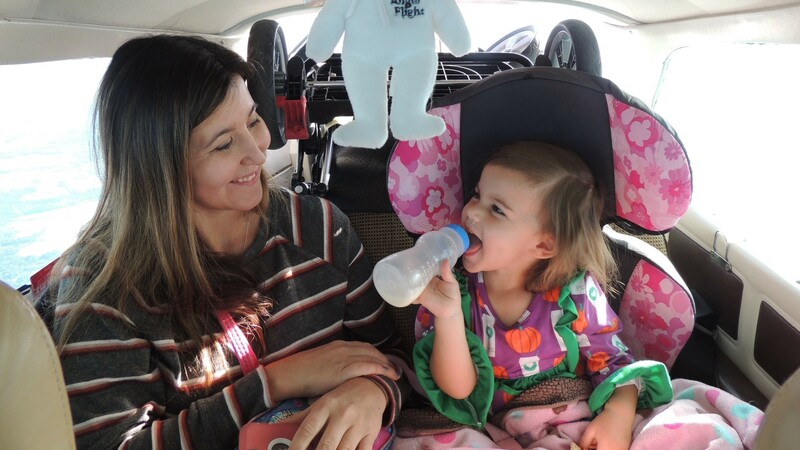 Double Mission Angel Flight, Philadelphia PA to Beckley WV (October 22nd, 2018) Madison goes home! On today’s flight we were so excited to be going back to Philly to pick up little Miss Madison and her mom Jackie (last week we were the 2nd leg of a 2 leg flight that took them to Philly for Madison to have surgery at the Children’s Hospital) Today we would be taking them all the way back home to Beckley WV! Miss Madison is an absolutely adorable little two-year-old that melts your heart as soon as you see her! While at The Children’s Hospital, Madison underwent surgery for laryngeal cleft repair, a problem she has had since birth that can allow food and liquids into her little lungs when swallowing. The doctors said the surgery went well and that they would know more once she has healed completely. We departed home base early at around 7:10 and climbed on up to greet the sunrise. Our ride was very smooth and the views were spectacular as the sun peeked up over the Blue Ridge, making ready for a new day! We made good time with the help of a nice tailwind. When we arrived at Philly International, Miss Madison, and her mom were there waiting for us. She was all smiles and very active as if nothing had happened to her! She was all ready to go home, and, to fly again (she really liked flying)! Her mom Jackie told us that she was really doing good and that the doctors wanted her to be eating normally, but little Madison was not ready for that, she tended to be only wanting to drink her bottle and not ready for much food just yet. It was so good to see her so happy and jolly, little children are so resilient and innocent to some of the harsher things in life…. as adults, we could all learn a thing or two from them! Miss Madison was all excited as we walked out to 49Bravo to load up for her flight home to Beckley, and as I secured her into her car seat (now airplane seat), she was all smiles! From Philly to Beckley was a three-plus hour flight due to some fairly strong headwinds, but the ride was extremely smooth, even over the mountains of West Virginia, and our views were fantastic (she even got to see some snow over the ridges of the Alleghany Mountains)! She did very well the entire flight, such a trooper, three hours is a long time for a two-year-old to sit (actually it is a long time for me to sit as well)! At Beckley, we landed on runway 19, and as I was getting Madison out of her car seat she looked at me with a big smile and said, “nice landing” which put a big smile on my face! As we walked into the FBO she was talking just as fast as her little legs were walking, it was such a joy seeing her so happy after having surgery just a few days earlier! After we had our group picture taken by a nice gentleman that was in the lobby, we enjoyed some more conversation while Miss Madison was busy playing and having fun with Captain John. Then, after many hugs, it was time for them leave and I helped carry their things out to their car. At the car, Madison held her arms out, wanting me to be the one to put her into her car seat, my heart melted once more! As they drove off, John and I headed out to 49bravo with big smiles and warm hearts, ready for our flight back home. Our flight back home was a little less than one hour with the help of some good tailwinds (we averaged around 180mph) and again the ride was very smooth. On the way, we initiated our I.A.P. (In Air Picnic) which we enjoyed very much while watching the world go by. Back at home base, we landed on runway 22, and Jimmy came on the radio welcoming us back home, at which time we informed him that the coffee would soon be ready. It would be our first cup of the day and boy we were looking forward to it! After tucking 49bravo in, we enjoyed great coffee and conversation with Jimmy in our “Pilots Lounge in the Hanger” …… (Jimmy works at the airport and helps to keep 49bravo fueled and ready to go). After our coffee, and as always at the end of an Angel Flight Mission, we bravely proceeded on with our most dangerous part of the day, our drive home! Hope you enjoy our following photos of the day, and please remember ….. if little Miss Madison can be so brave and strong when things get tough, then so should we! Have a great day all, and thanks so much for following our flights! There she is! The beginning to another beautiful day! The Green Bank Telescope……. largest, fully steerable radio telescope in the world! Happy to hear about the end of the run. All happy faces and why not? Thanks to Nevins and Billings. And Madison took it all in stride. God Bless her and her mom. Great photography, also, especially over historical sites. You gentlemen are Angels sent from Heaven…..2 in a million! Loved reading about Little Miss Madison and your pictures were wonderful. You guys Are so special in all that you do. Fantastic – I loved catching up with Little Miss Madison and her mom – and the pilot and co-pilot. What number flight is this for Capt. John and Nevin?